Through sheer force of geographics we’ve always been “eco” here, long before it became fashionable, and slowly, slowly we’re always working towards becoming better and reducing our carbon footprint; I doubt there are many “establishments” our size in Europe that are so totally reliant upon solar energy even nowadays. To begin with, more years ago than I care to remember actually, our sole source of light was candles and paraffin lamps like that above … then we managed to get hold of some small solar panels – from Wales if I remember correctly – and rigged up a second-hand car battery and 12 volt lights, then we doubled it all up and became 24 volt. The light was never enough though, and trying to run a business – even a tiny one like the Quinta was back then – on 24 volts was a right headache, so over the years we slowly expanded our solar arrays to become 240 volts like everyone else, but with a huge bank of batteries, and this process of expansion has continued ever since. 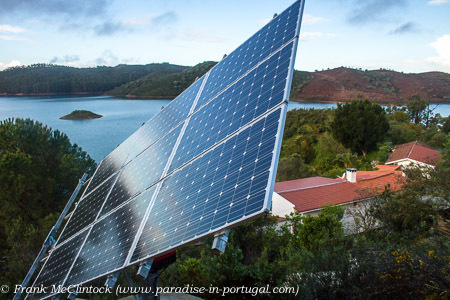 This winter we took another huge leap forward with a whole new array and a new inverter. and now it’s all operational, pumping out megawatts! 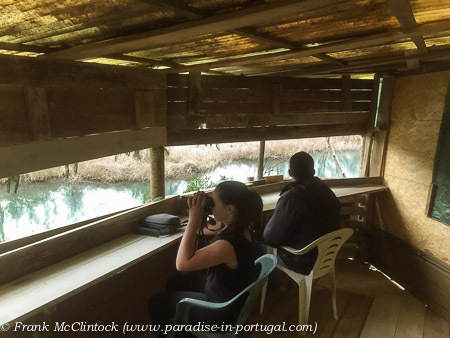 We also built a birdwatching hide down in Santa Clara this winter, overlooking the slow-moving river, and have had all kinds of brilliant sightings from it – Water Rails, Bullfinches, Cirl Buntings, Rock Buntings, Cetti’s Warblers, Otters and even yesterday a trio of Lesser Spotted Woodpeckers. 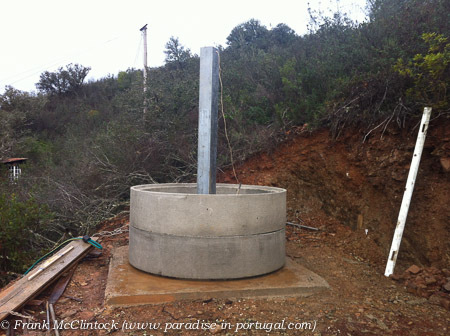 We built it not just for “Birding in Portugal” but for the community in general, but, as ever, we had to keep the costs as low as possible, so we built it more or less from scrap and old building materials we had left over from building projects at the Quinta. 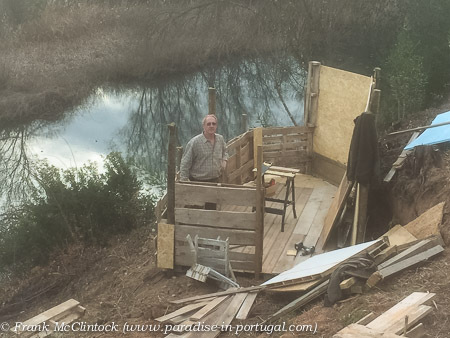 Old pallets, shuttering boards, old floorboards and bits of roof, anything we could lay our hands on, and it’s turned out better than even we expected, (probably because we had the help of the SAS! ), with wicked views over a water lilly covered pool with reeds to our left and right. 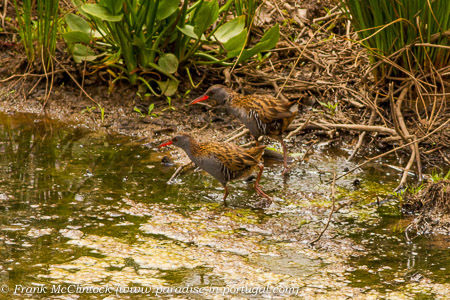 Our primary species here was Water Rails, and in that we haven’t been disappointed as there’s a pair nesting nearby and we regularly see them walking along the shore opposite oblivious to our presence – a fantastic opportunity for photographers as they’re a rareish and extremely shy species scarcely ever seen out in the open. We normally see them on their own, but occasionally they take a stroll together and I’ll close this post with a shot of the couple – to see two together like this is as rare as dragon poo in Oxford St!